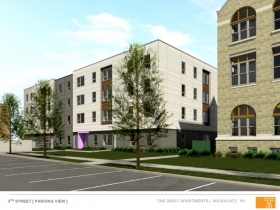 The Griot Apartments – N. 4th St. and W. North Ave. View. Rendering by Eppstein Uhen Architects. Development of the Historic Garfield School Cultural Campus took a major step forward Tuesday after the city’s Common Council approved a development plan for the site including a zoning change, a real estate sale and the creation of a tax incremental financing district for the site. The area, nearly the size of a city block, will be the site of 71 new housing units and 8,000 square feet of commercial space. 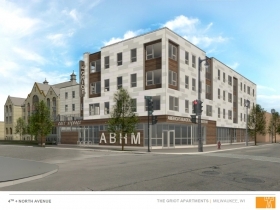 Most of the space, about 6,000 square feet, will house the American Black Holocaust Museum, which was acquired by the Redevelopment Authority of the City of Milwaukee in 2009 after financial troubles left it in jeopardy of being bought by a bank. Monday at the Zoning, Neighborhoods & Development Committee hearing, Brad Pruitt, a local artist, film-maker and advisor for the museum, called race one of “our most intractable issues,” adding that there are “fewer and fewer places anywhere in this country or in the world” that can unify people of different races. “The American Black Holocaust Museum has always been one of those places,” he noted. The area, rezoned for commercial and residential use, is to be sold to developers Maures Development Group, LLC and J. Jeffers & Co. as six parcels sold together for $6. 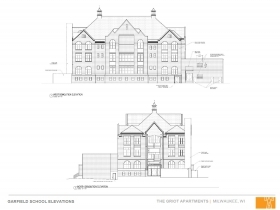 The parcels include the old Garfield Avenue Elementary School built in 1889, the former Black Holocaust Museum and Grant’s Soul Food restaurant, along with three vacant lots. The restaurant was owned by members of Ald. Russell Stamper’s family until it was acquired by RACM in 2008 for future development. 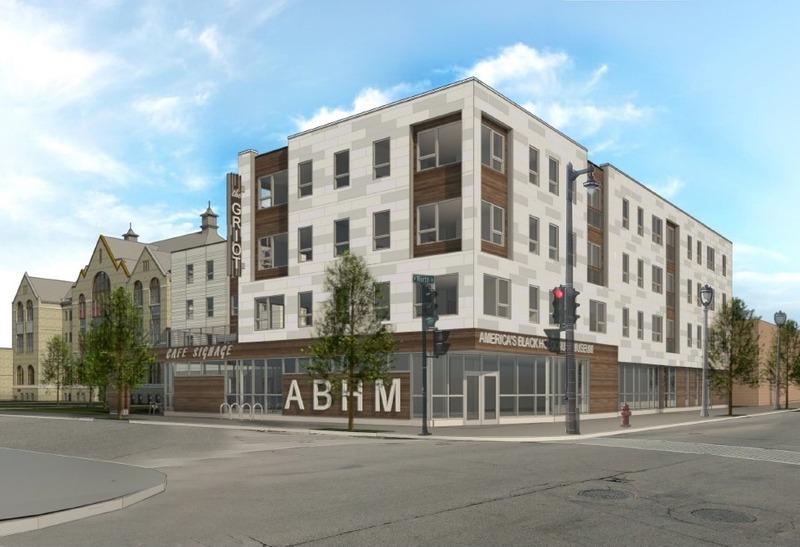 The $16.6 million project will not only create a center for culture and history in the Historic Bronzeville district, but is expected to lead to further development in the area. Ald. Milele Coggs, who represents the area, said that when the Common Council created the Bronzeville Culture and Entertainment district in 2005, the museum was seen as one of the district’s anchors. She added that the 71 housing units will bring residents to the area which should help spur future growth. 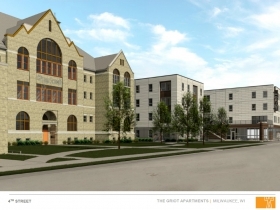 The Garfield school building will have 30 housing units, all set aside for families making 60 percent or less of the area median income through a Wisconsin Housing and Economic Developments non-competitive tax credit and tax exempt bond program. “Every classroom basically becomes a unit,” said Mark Ernst, architect for the project from Engberg Anderson. The building’s painted exterior will be stripped to reveal cream city brick beneath, and new windows will also be installed, he noted. The developers are marketing some of the space in the Garfield building to artists, as part of a broader plan to attract artists to the entire Bronzeville neighborhood. In order to target artists, features such as wide corridors and tall ceilings for the easy transportation of large materials were implemented in the building’s design, along with hardwood floors and natural lighting. 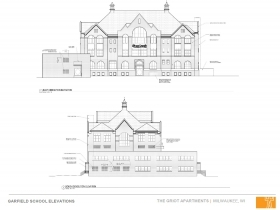 North of the redeveloped Garfield school will be the new building with the museum on the first floor and The Griot apartments on the upper three floors. The building will have a wooden base and cement board siding. Josh Jeffers, president of J Jeffers and Co., said there is potential for a solar panel array on top of the Griot. In the remaining 2,000 sq feet on the first floor, there will be a retail and community area. The city is helping finance the redevelopment through the creation of a new tax incremental district, TID 89, with a contribution of $1.435 million, to be recouped from future property taxes generated. Ald. 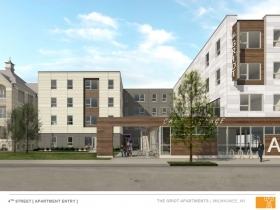 Jim Bohl noted, the city normally pushes for developer financing of projects like this. However, according to Maria Prioletta of the Department of City Development, this one is unique. Payout on the TID won’t begin to happen until the project is complete and the rental units are leased up, she said. The Black Holocaust Museum memorialized victims of lynching in America. In 1999, it won national acclaim for an exhibition of the Henrietta Marie slave ship. But the museum’s funding dissipated after founder James Cameron, who survived a 1930 lynching, died in 2006 and as the nation fell into the Great Recession.